This is a book written specially for new comers who have no idea about Reiki energy. Reiki Grand Master Poonam Sharma has taken the effort to answer the queries raised by her students. Myths and facts about Reiki have been cleared in this book. It has 26 hand positions in pictures as taught by Dr Mikao Usui. It is to the point and precise. Wisdom of chakras, colours, body mind awareness and method of treatment of diseases is clearly explained. This Reiki book is written in a simple way so that a beginner can easily understand it. Children and grownups would equally love it for its style and colourful pictures which are a total feast to eyes and soul.This book is equally beneficial for Reiki Channels and new students. Poonam Sharma, born in 1967, started feeling the blessed power in her, early in her childhood. Always engulfed in books on mysticism, faith healing and astrology since her childhood days; she is now engaged in various guidance activities. Simple by nature, she is a master of many techniques. Bharat Nirman Award winner, apart from being a member of the American Tarot Association, she is a Spiritual Master, Tarot card Reader, Astrologer, Emotional Freedom Technique Practitioner, Vastu Shastra Consultant, Numerologist and a Reiki Grandmaster. In 2004, she started a center for Healing and Guidance under the name Krish Consultations. Many courses on Reiki, Tarot and Hypnotherapy are conducted here. Recent launch of the Global Institute of Tarot and Astrology (GITA) is an effort to show light to people through the divine wisdom of Tarot and Astrology. With her sole aim to deliver the best of ancient wisdom of Vedas and modern techniques; she perfectly balances the role of destiny and karma; helping you to benefit from the best of both. “Reiki is a wonderful gift of cosmic energy which can be shared between us all. 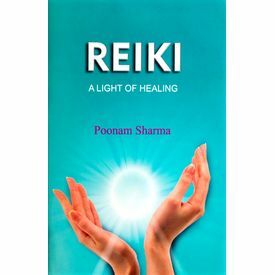 It is like a flame being passed from person to person, lighting a light within each person it touches.” - Poonam Sharma This is a book written specially for new comers who have no idea about Reiki energy. Reiki Grand Master Poonam Sharma has taken the effort to answer the queries raised by her students. Myths and facts about Reiki have been cleared in this book. It has 26 hand positions in pictures as taught by Dr Mikao Usui. It is to the point and precise. Wisdom of chakras, colours, body mind awareness and method of treatment of diseases is clearly explained. This Reiki book is written in a simple way so that a beginner can easily understand it. Children and grownups would equally love it for its style and colourful pictures which are a total feast to eyes and soul.This book is equally beneficial for Reiki Channels and new students. Poonam Sharma, born in 1967, started feeling the blessed power in her, early in her childhood. Always engulfed in books on mysticism, faith healing and astrology since her childhood days; she is now engaged in various guidance activities. Simple by nature, she is a master of many techniques. Bharat Nirman Award winner, apart from being a member of the American Tarot Association, she is a Spiritual Master, Tarot card Reader, Astrologer, Emotional Freedom Technique Practitioner, Vastu Shastra Consultant, Numerologist and a Reiki Grandmaster. In 2004, she started a center for Healing and Guidance under the name Krish Consultations. Many courses on Reiki, Tarot and Hypnotherapy are conducted here. Recent launch of the Global Institute of Tarot and Astrology (GITA) is an effort to show light to people through the divine wisdom of Tarot and Astrology. With her sole aim to deliver the best of ancient wisdom of Vedas and modern techniques; she perfectly balances the role of destiny and karma; helping you to benefit from the best of both.